I am passionate about eliminating inequalities in low-income communities and opening students’ eyes to the amazing world of possibilities available to them, like going to college. UMBC has provided me with ample opportunities to both mentor students in Baltimore and study the achievement gap in high-needs school districts. Sayre Posey is a Sondheim Public Affairs Scholar and Honors College member graduating with an exceptional academic record and big plans to serve Baltimore City as a history teacher. Posey has received numerous honors and awards, including the 2016 Joseph Reese Best Essay Prize from the history department; Samson, Rosetta A., and Saddie Feldman Award for demonstrating citizenship through community service; and 2016 Maryland Teacher of Promise award from the Maryland State Department of Education. A freshman year volunteer experience with The Choice Program at Augusta Fells Savage Institute in Harlem Park helped Posey realized “the only career I wanted…was teaching.” Since then she has served in a several afterschool and summer programs designed to provide enrichment and support for Baltimore students. She has mentored at-risk high school girls with The Choice Program, tutored Burmese students through Refugee Youth Project, spent a year teaching reading and mathematics to elementary and middle school students at the Y of Central Maryland’s College Gardens Youth Program, and worked at the Johns Hopkins University Center for Talented Youth. 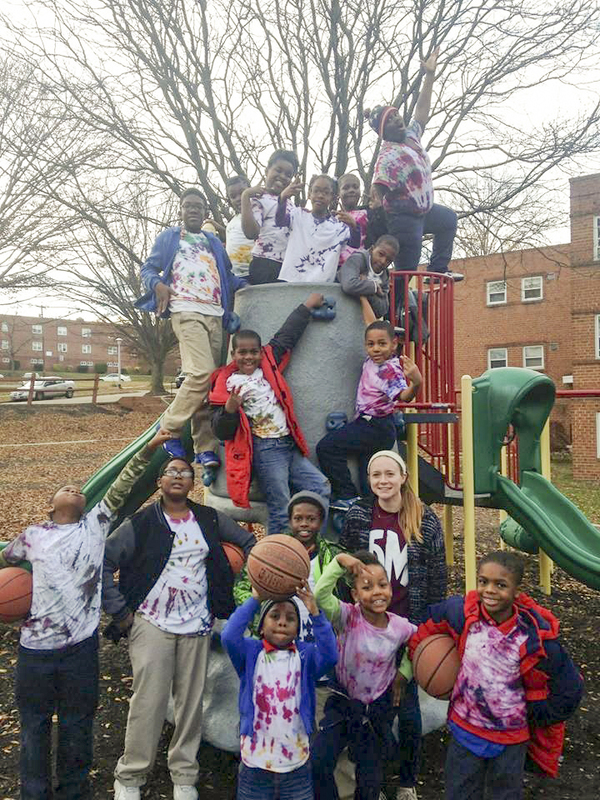 “Volunteering at after-school programs in Baltimore was a central part of my UMBC experience, and I can credit the myriad of service opportunities through The Shriver Center for sparking my passion for teaching,” says Posey. This spring Posey completes her student teaching internship at Patapsco Middle School, teaching 8th grade U.S. history. She has accepted a placement to teach 9th grade U.S. history in the fall at Edmondson-Westside High School, a Baltimore City public school. Images: Sayre Posey with her students at the College Gardens Youth Program before the annual Turkey Trot around the Irvington/Beechfield neighborhood; photo courtesy Sayre Posey. Portrait by Marlayna Demond ‘11 for UMBC.